The Beckman Coulter Biomek NXp Robotic Liquid Handler is designed to handle every aspect of liquid handling, pipetting, dilution, dispensing and integration in to one powerful compact unit that will fit where you need it. This efficient robotic liquid handler is set with a Span-8 pipette model, 4 fixed tip heads and 4 disposables, with rotating gripper and 8 channel liquid level sensing for an efficient and hands-free workflow. This automated workstation has up to 12 deck positions, automated labware positioners, and labware stacking for on deck storage. The open-ended flexibility of this robotic handler helps keep your lab agile and adaptable to your needs. The Beckman Coulter Biomek NXp Automated Workstation has a dispensing volume of between 0.5 µL - 5,000 µL and supports labware from tubes to 1,536-well microplates with accurate intra-well pipetting. The Beckman Biomek NXP can integrate with third party devices, and is configurable to meet specific applications needs. This automated workstation is computer controlled through the Biomek software, a robust suite that compliments this efficient instrument with methods and capabilities for genomic, drug discovery & basic research workflows. The Biomek software guides users through set up and protocols, quickly and easily through an icon based interface, with data tracking and LIMS connectivity. 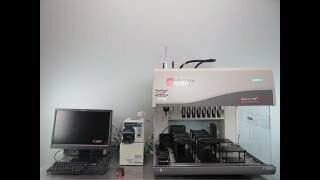 This Beckman Coulter Biomek NXp Robotic Liquid Handler is in excellent condition with all components operatiing as expected. All of our lab equipment comes backed with our standard warranty should you have any questions, please don't hesitate to contact us.